Michal Hrušecký writes about Linuxdays 2013. 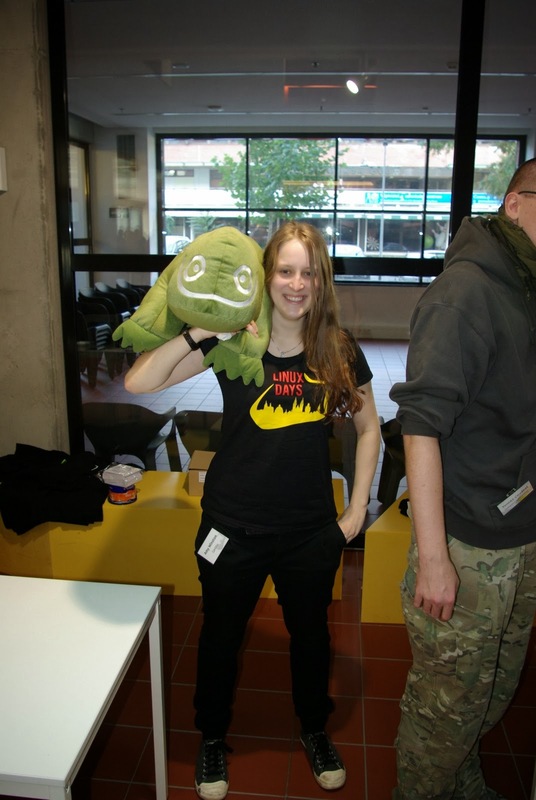 Last year, openSUSE helped this event kick off big, and we were there again this year! 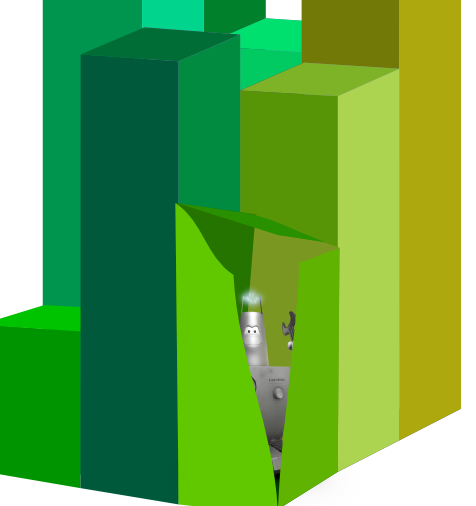 Of course you remember the openSUSE Conference 2012: bootstrapping awesome, the four-for-the-price-of-one event? The one in Prague? We had the combination of the openSUSE Conference, SUSE Labs, a Gentoo miniconf and the local LinuxDays conference. The last two for the first time ever. While Gentoo miniconf didn’t have continuation, LinuxDays conference has been bootstrapped successfully and this year in the beginning of October, the conference took place for the second time. And Amazing it was. Let’s start with some numbers. Before the conference started, there were 650 registrations. On Saturday about 400 people went through registration and on Sunday about 300 joined the event. A little geeky number – about 600 different Mac addresses connected to the WiFi. The event featured 31 talks and 6 workshops for these visitors. Presentations were for both beginners and advanced geeks. 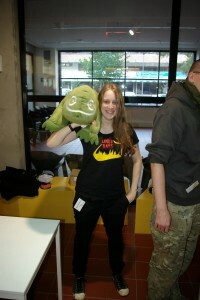 There were talks describing Gnome 3 evolution, news in Libre Office or how openSUSE gets created. On the other hand, there were talks about MySQL fine tunning, an introduction to Autotools and a session about TCP Multipath. 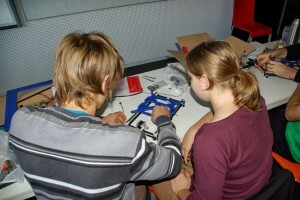 Another interesting part of the conference was the 3D printing workshop. It ran through the whole Saturday and a part of Sunday. People could order parts for 3D printers with delivery to the conference and there was a team of experienced 3D printer builders in the workshop helping people build their own printer. There was huge interest in this workshop, but due to the limited capacity, only the first nine registrations were accepted. In the end all nine 3D printers were successfully built and many people saw and learned how to build their own! 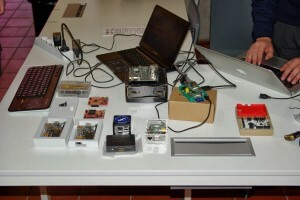 Like last year, there were booths with various interesting open source projects. Mainly distributions – Debian, Fedora, Gentoo, openSUSE, Slax and Ubuntu – but there were also XFCE and Geany booths, an OpenMobility booth and a booth with some geeky stuff to buy, like mugs, T-shirts or Raspberry-Pi’s with various shields. As far as the openSUSE stand goes, people liked our DVDs, both the ones with openSUSE and SLE (we had some evaluation versions to give away), but as always Geeko got the most attention. People just looooove this lizard. 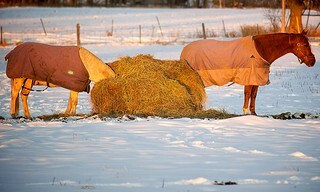 We had plenty of questions regarding where can they get one. Overall, the conference was quite a success and there will definitely be a LinuxDays 2014! 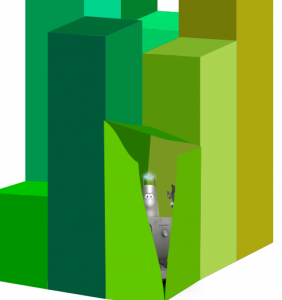 As part of the openSUSE community efforts gearing up for openSUSE 13.1, the openSUSE team has been hard at work on a variety of things. Ludwig Nussel, in his role of controller in the team, keeps an eye on progress of the tasks we have been assigned. He gives an overview of some of the things we have been doing. For beta 1 the focus was on testing and of course practical changes in a variety of areas. Here’s a list of the tasks on progress.opensuse.org. After the btrfs discussion we checked out how often it is used and did some recommendations to give it extra testing. The result was that it was clearly mentioned in the Beta announcement and that during the installation YaST2 would ask if you could test btrfs. We organized the Beta Pizza Hackaton, getting internal help from the SLE team on fixing openSUSE bugs. The idea came up to make it a contest. We went over the bugs that were reported, putting them in categories (bronze/silver/gold) to signify importance for the release. We developed an IRC bot to announce changes and a script to record who-did-what to help a committee of ‘wise men’ to decide who would win. In the technical area, we agreed with the documentation team to move the manuals into activedoc. That way they are easier to maintain and always up to date. And Greek was included as primary language on the dvd! We also had to work with MS to get the bootloader and kernel signed properly for UEFI systems, we documented the development process, hacked further on testing tools, and of course there was a lot of writing of articles for news.opensuse.org. 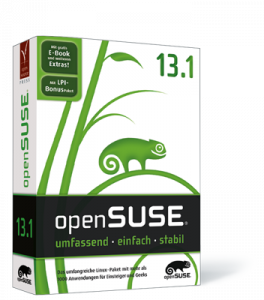 Last but not least, we’ve been talking to Open Source press and helping them to ensure we have a boxed version of openSUSE 13.1 in Germany. We (and the openSUSE Board, as it is their decision) are still looking for providers in other countries! To help the marketing team, we made and ran a script to remind packagers to tell marketing about their features. Based on this and help from the community, we made a start with the feature guide, writing about KDE, GNOME and the Linux kernel. 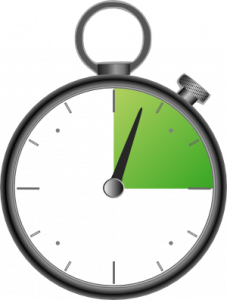 A second goal was to get the ‘promote openSUSE 13.1’ article out, for which we had to kick people for artwork and we had to update countdown.opensuse.org. 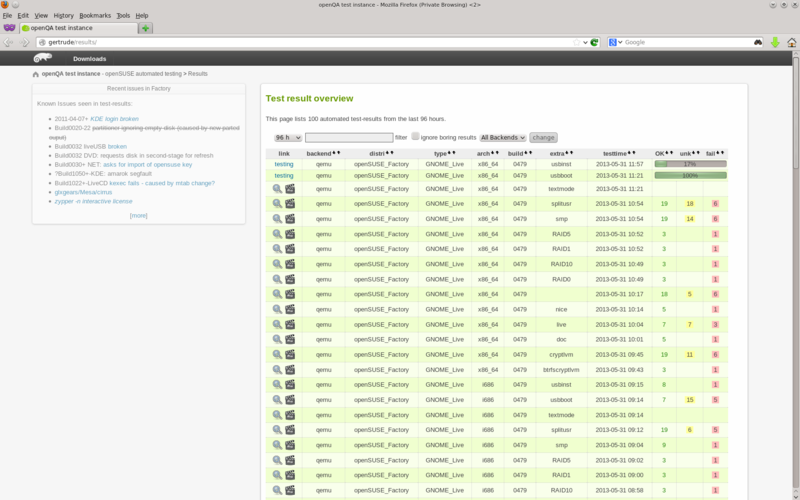 We also updated software.opensuse.org with information about the USB stick installation. 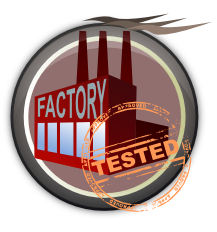 On the technical side, we did a lot of testing work and of course pick fixes to go into Factory. There was also work with Legal for a new EULA (End User License Agreement) which does not mention Novell anymore (will be included in the final); and we added openSUSE 13.1 to bugzilla, pinged our translators about the release and kicked people about the community repos. As you can see, there are a lot of tasks we have to juggle. 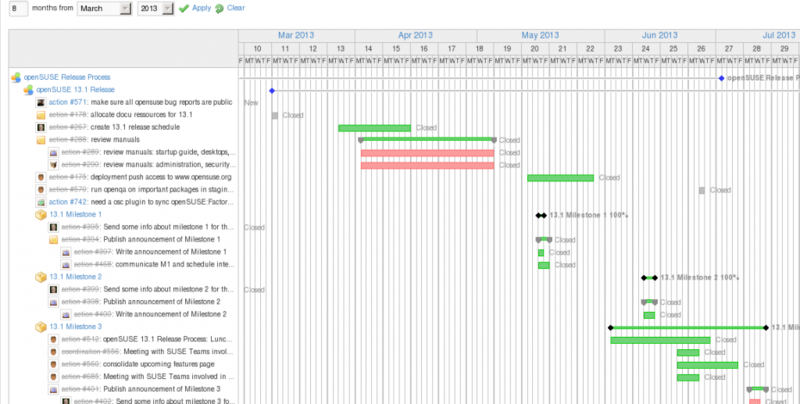 progress.opensuse.org with it’s useful Gantt chart is a big help for that, but it also simply requires work: checking what is done, what is not done, kicking people to do their thing. We’re hoping to get more community members involved with progress.opensuse.org – a few are already helping out via this tool and you’re welcome to check out how we do it! The end result is that we can release a quality product, on time – something to be proud of! It is time for an update on openQA! Alberto Planas Domínguez discusses how to install and create tests (or “needles“) for the tool that helps keep openSUSE Factory stable. Our work on openQA was introduced a few months ago on this blog. To recap, the major improvements we made were related to the detection of failed and succeeded tests by introducing the ‘needles’ (PNG files with metadata associated in JSON format) and using openCV to determine test results; and a host of changes to speed up the testing process and improve the webUI a bit. 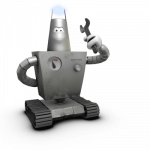 The work is currently residing in a branch by the openSUSE team on github but the original author, Bernhard Wiedemann, plans to test, integrate and deploy openQA during hackweek. The fact that the new code isn’t running on openqa.opensuse.org yet is unfortunate but not a huge issue. Right now, to contribute test cases, you have to install and run openQA yourself. 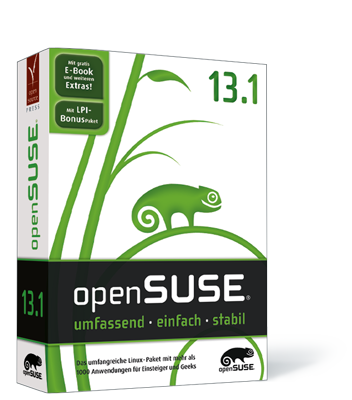 And with the packages available for openSUSE this is not a huge deal. So, let’s talk about using openQA and creating test cases! After that we need to make some adjustment in the apache configuration before we can run the service. See the openQA Tutorial for the details. If we have systemd running, the workers will take the jobs, create a virtual machine, and run the tests in order. Look Ma, my first test! In the first command we send a keystroke to the system, in this case alt-n because the dictionary $cmd maps the “next” key to this keystroke. 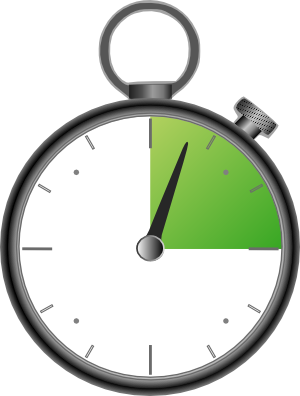 After that we wait 30 seconds and check if we find an image compatible with the “inst-timezone” needle. Inside a test, the main function that can be used to send events is sendkey(), and sendautotype() when we want to send a full string. When we want to assert the current image we can use waitforneedle(), which launches an exception if the needle is not found, and checkneedle(), which returns the result in case that we have a match between the current image and a needle. We use checkneedle() instead of waitforneedle() to make a decision inside the test instead of making an assert and marking the test as failed. # Determine if the test can run. # rollback of the VM status. The method is_applicable() is called to check if the test can run for a given configuration (more about this later). If the function returns true, openQA will call the run() method. It is in this function that we need to put the test code. 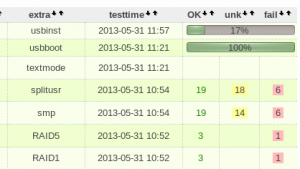 The test_flags() is used to decide what to do when the test fails. Depending on what this function returns, openQA can decide to mark the ISO as a wrong ISO if the test fails, or mark only this tests as failed and continue with the next test. There is one more interesting feature here. OpenQA makes snapshots of the CPU, the memory and the hard disk (using a QEMU option). If the test goes well openQA creates a snapshot labeled ‘lastgood’ that can be recovered if the next test fails. This feature is useful to guarantee that every test can be started from a stable system (and failing tests can put the system in an non stable state). When openQA creates a new test job, what is really doing is setting a specific combination of environment variables that need to be checked by the test in order to adjust the test’s behavior or to discard itself (through the is_applicable() method). If the variable DESKTOP is not KDE or GNOME, the test will not be executed. If you want to dig into openQA, you can check the source code and the different tests that are now running every day in our deployed instance. You can find the source code of V1 in Bernhard Wiederman’s repository github.com/bmwiedemann/os-autoinst and github.com/bmwiedemann/openQA, V2 is currently in the openSUSE Github account at github.com/openSUSE-Team/os-autoinst and github.com/openSUSE-Team/openQA with here the needles. As mentioned before, Bernhard plans on integrating the V1- and V2 code during hackweek. You can grab the code to learn by checking other tests, like for example the ones in x11test.d and inst.d. Currently, these tests would then be used by the openSUSE team (running internally) to keep the quality of the upcoming release up, but once V1 and V2 are merged and deployed, you can see and act on the results on openqa.opensuse.org. And as every week, here’s the top-10 contributors to openSUSE Factory of last week. We’re pretty much in bug fixing mode now so a big thanks to each of the contributors for helping make openSUSE 13.1 stable!